Home History History Never Happened! Who is David Irving? Who put the hit on Julius Caesar? Editor’s note: Yes, the date is right, this article is 7 years old. Why then has it upset people today, and it has? Over the past few years, author and historian David Irving has slowed down a bit and moved into the shadows. Editor’s Note Two: I had the pleasure of video taping four of Irving’s visits to Atlanta, one of them where C-Span was taping, which the AIPAC Lobby nixed the show by backing out, giving C-Span a way out of being tagged for censoring because they claime could not show just Irving’s part of the story without AIPAC’s. Of course they could have had a number of stand ins play the Israeli position role, but the goal was to not let Americans see what a solid lecturer that Irving was at the time. This is the same reason why VT has a corporate media blackout in the US, and is rarely publicly attacked. They do not want us to be able to respond and be heard. Was it Osama bin Laden or the Mossad? Was it the Illuminati or the Council on Foreign Relations? Did they do it together? Where was Marc Anthony after 9/11 when we really needed him? A sad thing, perhaps beyond comprehension, is that we know more about Julius Caesar than we know about or own recent history. 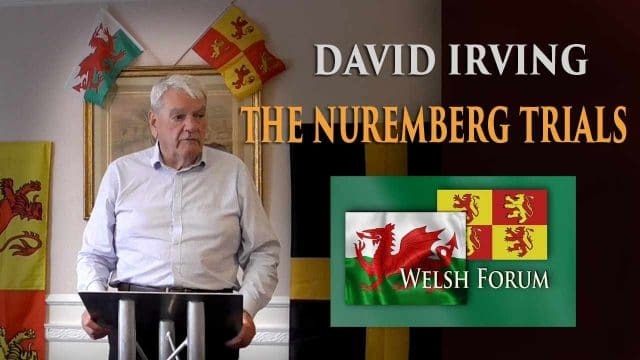 A few days ago someone sent me a link to a video by David Irving, the British author who professionally debunks everything. Irving, famous of late for taking on the holocaust, is the “go to guy” on World War II and Germany in particular. His research is, hands down, the best out there and he loves humiliating others for being duped by writing academic garbage based on secondary sources, too often proven, not just unreliable, but utter fiction. Irving’s case against Churchill is shocking and, worst of all, nobody has been able to debate him face to face. His sources are impeccable and his research beyond anything yet seen. This is a guy who will spend years reading letters, bank statements or travel around the world to get primary documents. Irving paints Churchill as a villain as great as Hitler, nearly as great as Stalin. Was World War II started by Churchill, a brilliant but immoral drunk, art forger and scoundrel who took payoffs from foreign intelligence services, banking cabals and anyone else willing to shove an envelope in his pocket? If so, then everything we know of World War II, of Hitler, of events of the 20th century is, not just a little bit wrong, but outrageously false. If the truth seems like outrageous propaganda, what have we allowed to happen to us? How can there be honest discussion on any subject, politics, religion or where to get decent Chinese food if all research is either “secondary source recycling” or, even worse, simply invented as we are now beginning to learn. Come to think of it, if I go on the internet, I can prove anything. I can even prove Hitler was Jewish. The accepted realities, our history as written in books, the history that defined Hitler, Irving implies, was as much history as today’s network news is, well, “fair and balanced.” What if every “fact” we use to refute Irving’s ideas came from Stalin? We know so much of what happened. I am reading the battle diaries from D-Day. I know there were landings, I know men died, but we don’t know why, only what we were told. Everything we believe is based on one known fact, that Germans are brutal and insane, a race of criminals, vicious monsters with an inbred need to destroy. 40% of Americans are of German ancestry, of course. It doesn’t take much research to learn that, in the 19th century, Germany became, not only powerful but the most advanced society on earth, science, philosophy, the arts, public welfare and education, Germany entered the 20th century as the leader of the world. German colonial policies, when compared to Britain, France, Spain, the Netherlands and Portugal, were typified by decency and humanitarian values. German citizens had more human rights, by a mile, than their British counterparts. A century later, Germany is a virtual mirror of mainstream “Midwest” America. Though politically castrated, Germany is what Americans wish their country was, in many ways at least. Germany has almost no military, almost no debt and relative freedom with one glaring exception. German’s have taken “political correctness” to a point that no American could imagine. Things heard on American television daily are crimes in Germany. If we aren’t willing to take the leap of faith that history demands, that Germans are monsters, then we are faced with something else. If Germans are who we know them to be, then we are a nation of liars and cowards, fools willing to follow any road, eat anything put on a plate in front of us. America could, very possibly, be a country scammed into war in Vietnam or Iraq or Afghanistan or, just maybe, into two wars with Germany. But again we leap to our feet, and scream. Many Americans are willing to consider that World War I was a “Vietnam” experience, phony atrocities and manipulation by a vast international conspiracy. That information has been “out there” for awhile and more and more are willing to consider it. However, the “sacred cow” of all time has been World War II. We aren’t talking Japan. No question, they attacked the United States. Germany, on the other hand, was that something else? We got used to lying to ourselves about the Civil War. Ask any American, we went to war to free the slaves. Problem is, the North only freed the slaves years later, when they were losing the war and only slaves in the South. The Civil War was over economics and bad government, “States Rights,” not slavery. How different is the truth about World War II? Should we have never gone to war with Germany and let them destroy Russia? How many Americans know that Hitler was willing to end the war in 1940 and withdraw his troops? How many Americans know that World War I could have ended in 1916 with an honorable peace but was pushed on by Balfour and Rothschild? Oh, you never heard that? World War II would never have happened, there would have never been communism, no Korea, no Vietnam, no Cold War, no potential for nuclear holocaust. Whose game are we playing then?